SI 60: Q&A with Steve Rushin: The story behind "How We Got Here"
Since first coming to SI in 1988, Steve Rushin has traveled all over the world, including a trip to Antarctica in 2012. On Thursday, SI.com kicked off the SI 60 series, in which we will republish, in full, 60 of the best stories ever to run in the magazine to coincide with Sports Illustrated's 60th anniversary. The first one we chose was "How We Got Here," Steve Rushin's magnum opus that ran as the cover story of the 40th anniversary issue in 1994 and is, at 22,000 words, still the second-longest piece in the magazine's history. The story is broken into five chapters, with a dominant figure in each of the first four chapters: Chapter 1 focuses on Roone Arledge, the longtime head of ABC News and Sports, who revolutionized sports on television; Chapter 2 is about Judge Roy Hofheinz, who built the Astrodome, ushering in an era that changed where sports were played; Chapter 3 centers on Gary Davidson, who led the rebel leagues like the ABA and WHA that forced the established leagues to expand; and Chapter 4 tells the story of Jim Brown, the legendary NFL running back who later became well known as an actor and an activist. 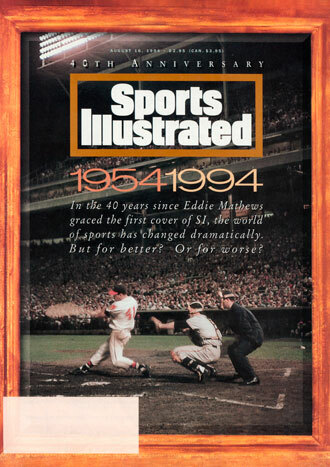 SI.com associate editor Ted Keith spoke with Rushin about how that '94 story came together. SI: Where did this story come from? RUSHIN: It was Mark Mulvoy's idea, he was the managing editor at the time. If I remember correctly it was sometime after the 1993 baseball season, maybe November, that he mentioned it to me. I kind of got going on it after the first of the year of 1994 with nothing else to work on and all the time in the world and all the leeway to write about anything I wanted. ​​SI: How did the story take shape? RUSHIN: David Bauer, at the time an assistant managing editor, was the editor of the piece. He and I sat down and it was his idea to try and tell the story through a handful of individual stories and individual people who could frame the big issues of the previous 40 years. Roone Arledge personified the rise in TV, Jim Brown personified race as well as the rise of the star athlete who became a film star, and we were able to talk about the adjustment of economics through the story of Gary Davidson. In fact, I had a very capable fact-checker and reporter on that story in Chris Stone, who did all of the reporting of the Gary Davidson component. He went out to Los Angeles to interview him while I was off doing the other guys. Chris [now the managing editor at SI] told me this past week that he remembers the story coming in the week of the Fourth of July of '94 because there was a big World Cup matchup at Giants Stadium the next day. I didn’t know at the time that he would become my boss. SI: Why did Chapter 5 center around the Mall of America, in Minnesota? RUSHIN: Mulvoy was in Minneapolis where I happened to be living at the time. We had dinner at the Mall of America one night to try and figure out what the last component of the story would be. He said, "What about this place?" There used to be a stadium in that location, the Twins had played there, I had worked on that spot [as a vendor at Twins and Vikings games]. It was the perfect place to land. When we were doing the 60th anniversary story we talked about, "What is the physical place this story ends?" and it doesn’t really end in a physical place. Everything is done on the Internet now. In fact, the day after I turned in my '94 anniversary story was the day Jeff Bezos incorporated what became Amazon. ​SI: Did you have a hard time settling on the central figures in the story? RUSHIN: There was a lot of luck involved. Everybody who we targeted we ended up using. We didn’t try three or four people first before we landed on Roone Arledge. Through Arledge we could talk about Howard Cosell and Monday Night Football, but we didn’t want to make the choices too obvious. I don’t think people knew too much about Roy Hofheinz. He built this Roman Colosseum type of place. It wasn’t just a domed stadium it was a place to conduct business to bring your clients, it was Houston so it was a little bit of off beat stuff in there. You had this very Boss Hogg-type personality you could tell the story through. We could have very easily done Race as a chapter and then Gender and then Drugs and Money and all these things, but I think it was much more interesting if you can bring all those elements together though the story of people. In fact, the day of my interview with Arledge, Richard Nixon had died and South Africa was having its first post Apartheid elections that resulted in Nelson Mandela becoming president. I got to sit in Arledge's office on a huge news day. That ended up being the first sentence of the entire story. ​SI: Did you work in order, reporting and writing Chapter 1 first, then Chapter 2 and so on? RUSHIN: My memory is that I did the Hofheinz part first. I don’t think I interviewed Arledge first. I think I interviewed Fred Hoffheinz, Roy's son. In the age before the Internet, he lent me this big hard bound volume about his father and the Astrodome. I remember reading that and these stacks of other books about the subjects. Then I think I did Arledge Chris was working on Gary Davidson. The hardest one to get was Jim Brown. I got his phone number, which hadn’t changed in like 25 years from [former SI senior writer] Richard Hoffer. I called him and spoke to him and he said he would do it but first I had to talk to this guy Rockhead Johnson. So I called this guy and said "Is Rockhead there?" "What?" "Is Rockhead there?" "This is Rock! Rock Johnson." Brown spoke in half sentences. When I went out there he gave me an address in Hollywood and said, "Meet me at . . ." and then said Chin Chin Restaurant. So I drove there on Sunset Boulevard and he wasn’t there. I sat there for an hour, finally asked if Jim Brown had come in and they said no. I called him and he said I was supposed to take a left at Hollywood Hills to go up to his house. So the next day I went to his house, I go in and there’s Jim Brown sitting in the den of his Hollywood Hills house in his shorts. He was great, I sat there with him for three or four hours. Then I had to race to the airport to make my flight. I got to LAX and realized I had left my computer bag with my computer and all my notes, back at his house. So I drove back there, there was a gate, the gate was open I rang his doorbell and nobody answered. So I had to break-and-enter into Jim Brown's house. I thought if Jim Brown comes out from the shower or something, the guy would rightfully kill me. I’d be beaten to death by Jim Brown. But anyway I grabbed my briefcase went to the rental car and drove away. In the story, Brown said that if he had the support of all the leading sports stars of the time he could solve the gang problem in the U.S. After the story came out I got a call from Stan Kasten, whom I knew from covering baseball and who at the time was the president of the Hawks and Braves in Atlanta. He said, "I read your piece. Is Jim Brown serious about that? Because if so I could enlist the cooperation of Deion Sanders and all the other stars of the day." I gave him Brown's contact information. Twenty years later Kasten became the centerpiece of the 60th anniversary story. SI: Did you stay in contact with any of the subjects of that story? RUSHIN: Sports Illustrated hosted a party for its 40th anniversary and all these guys were invited. Gary Davidson came to it, Roone Arledge was there, I don’t remember if Jim Brown was there. The short answer is no, I didn’t really keep up with any of them other than if they were in the news. I can’t to this day see Jim Brown without thinking I sneaked into this man’s house to get my computer. Even to this day I won’t forget sitting in Roone Arledge’s office near this wall of TVs. It was like Hollywood Sqaures; he had nine TVs, in stacks of three, while the Nixon funeral was on and the elections in South Africa were on. I was just in South Africa in June and I thought of watching those elections in Roone Arledge’s office. I don’t remember having any contact with them, though. The one I’ve had contact with most recently was the Mall of America. I was there just last summer. I'm sad to say that’s the enduring piece of that story. ​​SI: The story wound up at more than 22,000 words. Was it intended to be that long? RUSHIN: I don’t remember getting any kind of word count. I think the Astrodome one was the first and however long that one was became the model for how long each of them would be. I could write a 4,000 word story for SI so all I had to do was write five of them and hope there were connections for each of these chapters. All of these chunks had to make up a larger story. Chapter 1 had to have a beginning and end but it also had to serve as part of the larger story. I had in my head this is how we got from there, 1954, to here, 1994. That became the headline but I never had a headline in my head; that's the editor's job. I was just walking around the Mall I saw those maps that said You Are Here. That was the idea that I had in my head the whole time. The whole notion of it being the longest or second-longest, that’s not a superlative. That’s neither good nor bad, but it’s certainly not a compliment to say something is the longest to have run. It’s a fun factoid but it has no bearing on the quality of the piece. 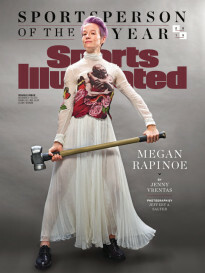 SI: Did breaking it into chapters make it easier to write? RUSHIN: I’ve found the same thing writing books: When you get over the notion of having nothing and get the words down it just becomes, as E.L. Doctorow said, like driving a great distance at night -- you can only see as far as your headlights, but you can make the whole trip that way. That’s how I operated: get this chunk down, get the next chunk down. It went relatively smoothly and pain free. It was fun to do. It was fun to learn about it. It’s not like I was some expert, I was learning as I went along. Same thing with the story for the 60th. I sat down and read a lot. It’s not a luxury you often have in journalism. In both cases I was able to sit down, read a lot and think a lot about what these pieces would be. It really helped when you went to interview people because you had a lot of questions you had thought about in advance. There was nobody that I contacted on the 40th that I didn’t wind up writing about. ​​SI: Did the story run more or less as you wrote it? RUSHIN: I’m sure some of it had to be cut but I don’t remember what was cut. David Bauer did an unbelievably great job of editing it. Whatever was cut I didn’t miss, which is one of the hallmarks of great editing. When it was done they sent me the pages, FedEx'd them to me in Minneapolis. When the whole thing was over I went to the Mall of America and bought an inflatable figure of the Scream, the Edvard Munch figure, that was deflated and sent it to Bauer, saying basically, "This long project is finally over." He blew it up and had it in the corner of his office for years. I was definitely pleased with the way it turned out. I was more relieved that anything else that I hadn’t wasted six months and however much of the company’s money. It would have been terrible if I hadn’t been able to produce something after six months. SI: When did you first see the issue? RUSHIN: I was in England when it came out. 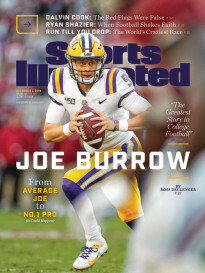 There was an all-sports bookstore called Sports Pages in London and I went in there and they had this stack of SI's on their checkout counter. I was flipping through it. I got to see the story and there was a letter from the publisher in the front and a picture of me, flattering as usual. I’ve never done anything like this before or since, and I said to the guys behind the counter, "Hey this is me!" And he says in perfect English deadpan, “So it is.” Like, big freaking deal. I became friends with the guy who managed the bookstore, Dave Luxton, and the guy who was the owner of the bookstore. Every time I was in England I would go out drinking with those guys. It was all because I broke character, perfectly playing into the American stereotype. SI: So you don’t keep up with Jim Brown but you became friends with those guys?